Beverly Diamonds sent me a sample solitaire ring to review. My husband happened to be the one who opened the package when it came in and I saw him out of the corner of his eye open it take a look and try to put it aside before he thought I could see it. I had forgotten to tell him that I was reviewing a really nice ring. He thought maybe one of my online readers had sent this to me, you know one of those that might stalk you and try to lure you into doing something you wouldn't normally do. The kids were present so he was going to wait until they went off to bed. I spoke up and said that is nice isn't it? He said yeah, where did you get it? I told him a review. He was floored. See our 25th Anniversary is coming up and he had wanted to get me a new ring. 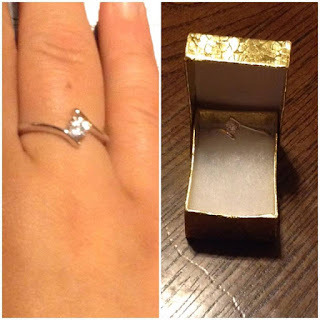 I lost my little chip of a diamond years ago and he wanted to plan something really special this year. Even though money didn't allow him to do so he still is not going to tell me what it was just in case by some miracle he can still get this idea done before October 9th for our anniversary. Sadly my wedding ring hasn't fit since I had a bout of sickness from a tick bite and his was ruined when it got caught on a piece of machinery years ago, so we are in for a total makeover here. This ring is beautiful but not quite what he wanted to get me for our anniversary. I love the design, it is simple like I would want it, but again not quite like what I would want for a replacement ring. Don't worry though I will be wearing this ring around until of course we can get that ring he has plans for, then it will be passed onto one of my daughters to cherish for years to come. Disclosure: MarksvilleandMe received one or more of the products mentioned above as part of a promotion with Tomoson and Beverly Diamonds. Regardless, MarksvilleandMe only recommends products or services we use personally and believe will be good for our readers. Some of the links in the article may be “affiliate links.” This means if you click on the link and purchase the item, I will receive compensation. If you would like MarksvilleandMe to review a product or service please contact us at marksvilleandme@gmail.com.